Are you ashamed to park in your dirty greasy garage? 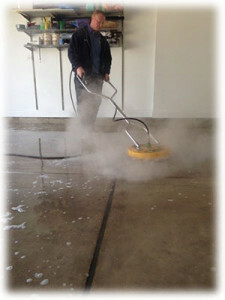 Let the cleaning professionals at Northern Power Washing help you clean it up! Garages in the Chicagoland area present numerous obstacles for the professional cleaner. From deep set stains requiring different cleaners and detergents, to making sure over-spray is contained so finished walls and other fixed appliances in the garage are not damaged, cleaning out a garage can be a labor and time intensive endeavor. Depending on how dirty the garage is the wash water will also need to be addressed, many municipalities will not allow oily, sediment filled runoff to enter their storm or waste water system, the wash water will need to be collected and disposed of properly or filtered before it is allowed to enter into the municipal system. 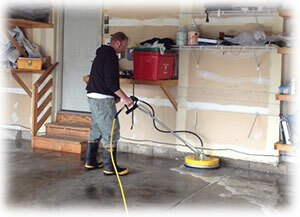 Northern Power Washing has been cleaning garages in the Northern Chicago Suburbs with excellent results for years. We care about the environment and only use environmentally safe biodegradable degreasers and cleaners to break down oil and dirt stains. Our hot water pressure washers allow us to heat our cleaning water up to 250 degrees the high heat allows us to effortlessly melt away dirt and oil. We use professional surface cleaners which contain the pressure washing nozzle, this virtually eliminates overspray and allows for a smooth even finish, no Tiger striping or wand marks will be visible when we are done. Want a clean garage floor you can be proud of? Contact Us today to schedule your free no hassle pressure washing quote.